NSW's music industry encompasses opera, orchestral, choral, chamber, indigenous, experimental, jazz, world, rock, musical theatre and contemporary music. The NSW music sector employs the largest number of concert presenters and touring organisations in the country, supported by peak and service organisations, with a network of 17 regional conservatoriums. The music, performing and visual arts (MPVA) sector has enjoyed an average employment growth rate of 7% per year from 2010–11 to 2015–16, making it the second-fastest growing creative industries segment in terms of employment. Around 17,000 people were employed in the NSW MPVA sector in 2015–16. More people in NSW attend cultural venues and events than in any other state. In 2013-14, almost 3.1 million NSW residents aged 15 years and over attended at least one performing arts event, including music concerts, operas and theatre performances. The Australian film and television industry is centred around Sydney, and the NSW Government is an active supporter of the domestic and international industries, providing a range of incentives to approved productions through the Arts and Culture Development Program. The media production and broadcasting (MPB) sector, which includes motion picture and video production, post production services, and television and radio broadcasting companies, employed more than 20,000 people in NSW in 2015–16 and saw employment grow by 2% in annual average terms over the last five years. NSW dominates the film and television industry, with commercial free-to-air broadcasters generating $2.38 billion in income in 2011–12, representing 51% of the national total, while NSW film and video production and post-production businesses generated $1.58 billion in income, or 63% of the national total. In 2015–16, more than 7,600 people were employed in the motion picture and video production and post-production services industries in NSW, around 54% of the national total. Screen Australia, an Australian Government agency, actively promotes and strengthens the film and television industry, offering funding from early-stage development through to production. 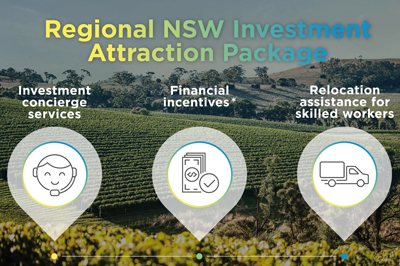 In addition, Create NSW has been established to assist the NSW film and television industry to promote Australia's cultural identity, encourage employment and investment, enhance the industry's export potential and nurture innovation. Screen Australia’s annual Drama Report shows that feature film and TV drama activity generated by NSW-based production companies accounted for 71% or $442 million of all Australian productions in 2015–16. NSW's creative services sector brings together Australia's largest concentration of information and communications technology businesses with creative arts enterprises in disciplines such as music, animation, new media and design. The sector is set to grow in line with the digital economy. Creative services are the major driver of employment growth for the creative industries sector as a whole, averaging 5% growth per annum from 2010–11 to 2015–16. NSW is a centre for creative services, and was home to 42% of Australia's creative services employment in 2015–16 and 38% of its creative services businesses (around 38,500 creative services businesses were based in NSW as at June 2016). Some of the largest creative agencies and internet service providers are located in Sydney, including McCann, Top Sugar Creative, Optus and Telstra. The design segment employed 44,000 people in 2015–16 in NSW (the largest design segment in Australia), with an annual average employment growth rate of 4% in the five years to 2015–16. Intellectual property is an important consideration for any creative arts industry. Australia has one of the world's leading intellectual property protection regimes. NSW, with its knowledge-intensive economy, leads Australia in intellectual property protection through design, trademarks and patents, with growth in standard and innovation patents. The next generation of creative entrepreneurs is preparing to enter this competitive and exciting industry.